Back on Market No Fault of Seller! 7+ Acres, Main Level Master & Move In Ready on Blacktop! Updated Kitchen, Newer Cabinets, Corian Counters, Pantry with Pull Out Shelves, Soft Close Drawers. Main Level Master Suite with Walk In Closet, Jacuzzi Tub & Walk In Shower. Convenient Main Level Laundry & Guest Bedroom. 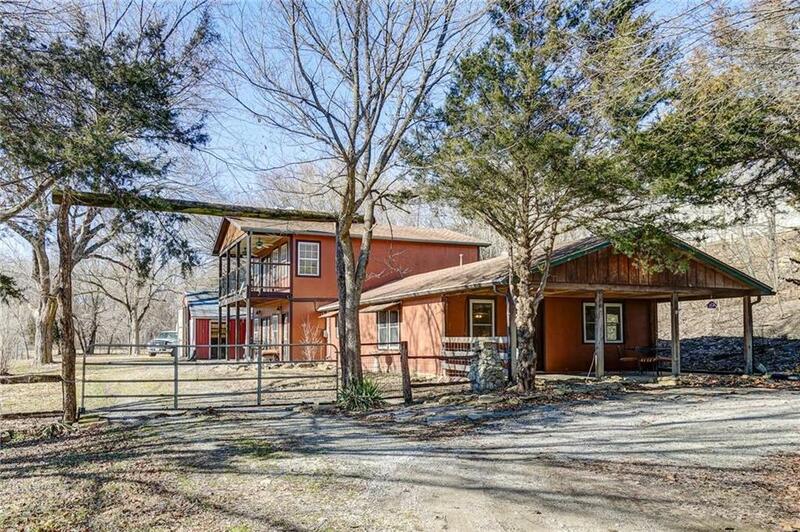 Upper Level with 2nd Living Room, 2 Guest Bedrooms & Balcony Overlooking Pasture, Covered Porch off Master & Living Room. Tankless Water Heater 2010, Custom Hunter Douglas Blinds. Only 30 minutes to KC! Directions: From KS Side of KC take S 69 Hwy - East on 247th Street turns into Main when across State Line - South on Highway D – East on Highway 2 - South on N Main - Home will be on the West Side. From MO Side of KC - South on Holmes Rd to Cleveland MO, then South on Highway D – East on Highway 2 - South on N Main - Home will be on the West Side.